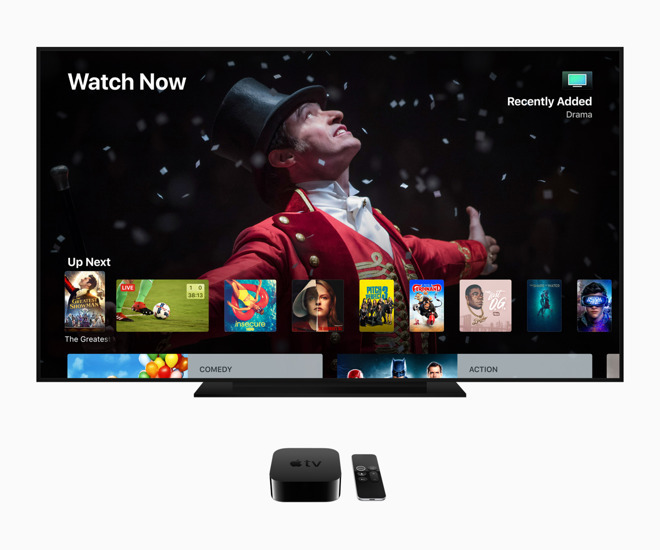 To lure in customers where ISP choice exists, AT&T is offering a free 32-gigabyte Apple TV 4K to new Fiber Internet subscribers — with a few catches. The deal is only available to people choosing a 300-megabit plan, which costs $70 per month, or with the $90 gigabit tier. Customers must also use the code "GET4KTV" at checkout, and lock themselves into a 12-month contract. AT&T is a long-time Apple partner, and last year used a similar promotion to draw people to DirecTV Now, its internet TV service. Customers were able to claim a free Apple TV 4K as long as they pre-paid for three months of streaming. Since that put the cost of the set-top at $105 versus its normal $179, some people signed up just to later cancel and keep the cheaper hardware. Apple may be willing to take a hit on Apple TV profits for multiple reasons. The company for instance faces tough competition in the world of streaming devices, with Roku, Google, and Amazon all making popular options. Many TVs now have competent "smart" apps, and/or support for Google Cast. A broad install base could also help support Apple's upcoming video service, featuring $1 billion or more in original content. That may launch as soon as March or April, offering the original video free to Apple device owners, with third-party subscriptions shoring up revenue. In the long term the company is rumored to be hunting for "tentpole" shows that could prop up a paid first-party subscription.